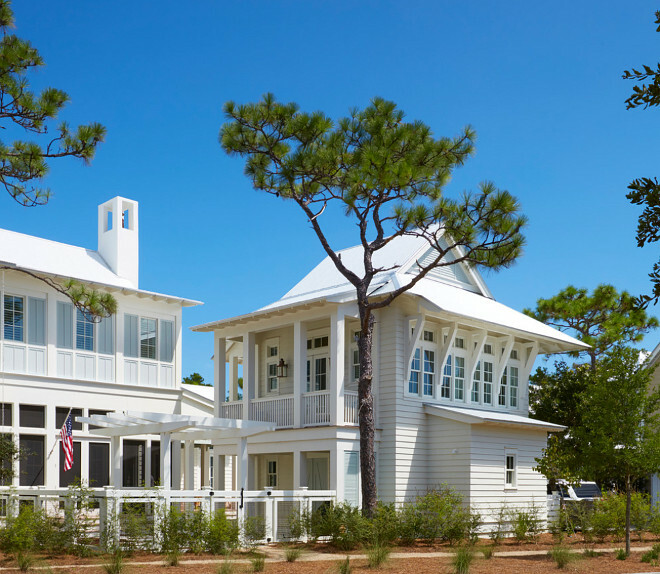 Designed by Geoff Chick & Associates and built by Chris Clark Construction Incorporated, this Florida beach house is full of new coastal design ideas! The architectural details are truly inspiring. 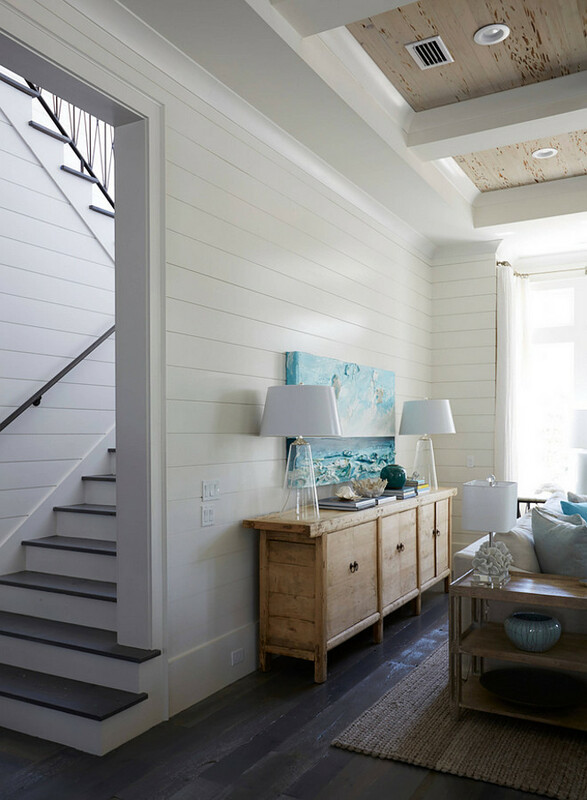 Walls are paneled with white shiplap and the ceilings, when not featuring shiplap, are beautifully crafted with coffered trim and pecky cypress wood. 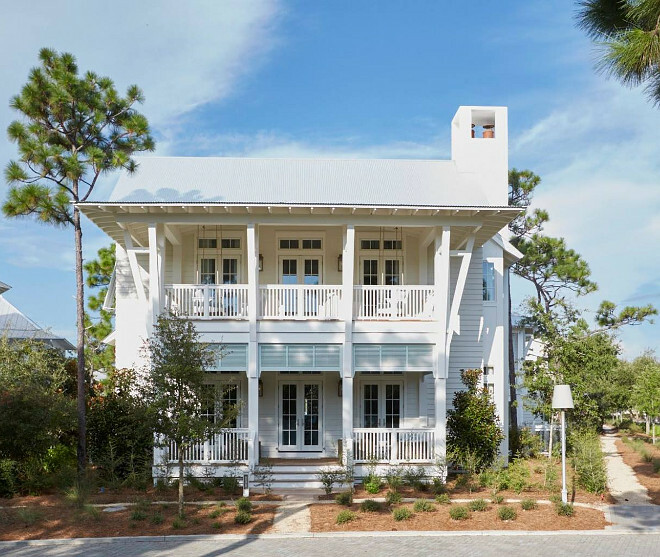 Located in 30A, this beach house has a very soothing, relaxing color palette that easily transports you to a sunny summery day. 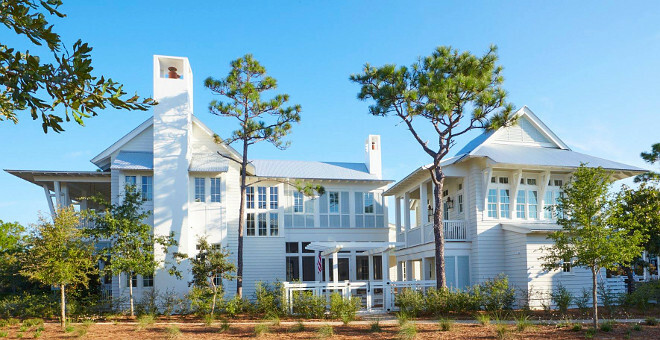 This white beach house is full of great architectural details, inside and out! 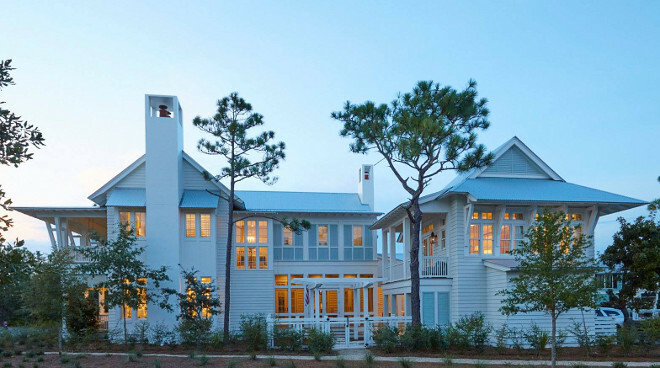 It’s easy to see why this home is being featured on Home Bunch today, right? Who would love to have a kitchen like that? 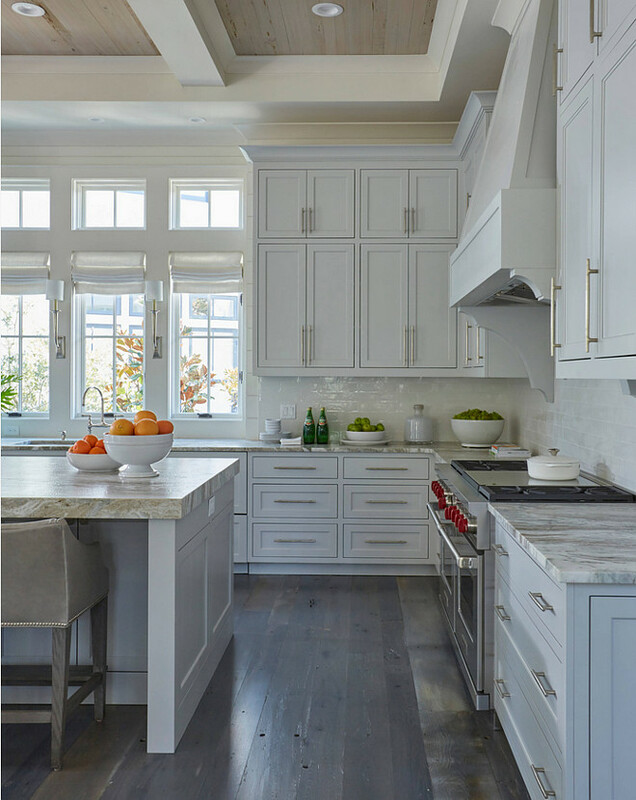 The light gray cabinets are painted in a color similar to Benjamin Moore OC-52 White Dove. Also, notice the gunmetal gray leather counterstools with swoop arms and silver nailhead trim. Beautiful Counterstools: here, here, here, here, here, here, here, here & here (slipcovered). The kitchen features light gray stacked cabinets adorned with long satin nickel pulls paired with quartzite countertops and a light gray glazed tile backsplash. The rustic wood floors are custom dark stained. The light gray kitchen cabinets are adorned with extra long satin nickel pulls. 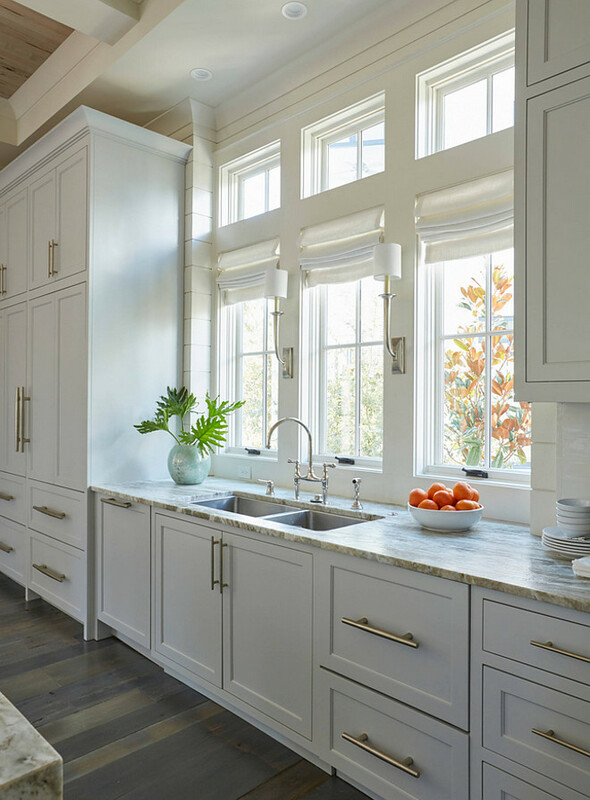 A stainless steel dual kitchen sink stands under a row of windows dressed in white roman shades illuminated by Ruhlmann Single Sconces. Stainless Steel sink is Blanco. 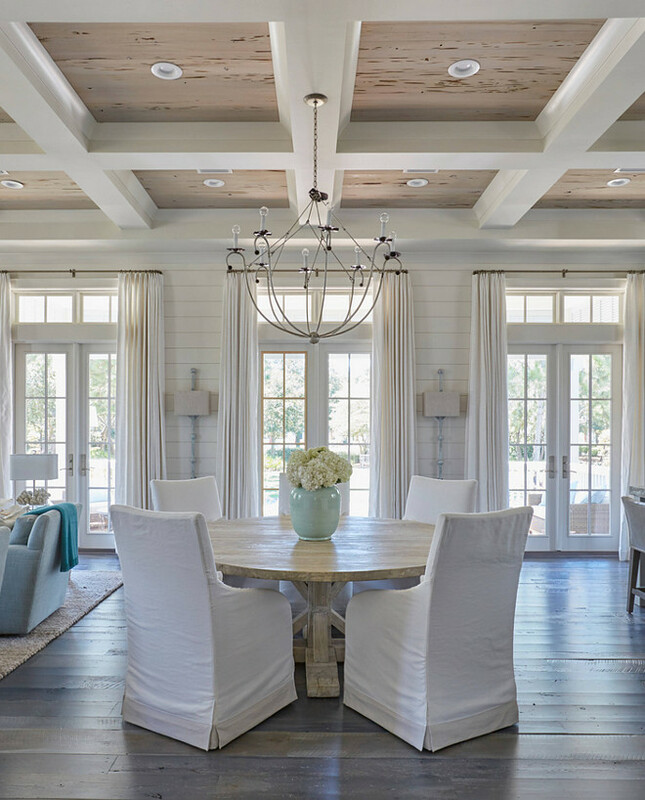 The dining room boasts a glossy white coffered ceiling accented with pecky cypress coffers accented with an iron chandelier. The round salvaged wood dining table surrounded by white slipcovered dining chairs. Beautiful Slipcovered Dining Chairs: here, here, here & here. Beautiful Dining Tables: here, here, here, here, here, here & here. The coffers are hollow 2×4 boxes wrapped in sheetrock, with a big crown over the pickled pecky cypress. 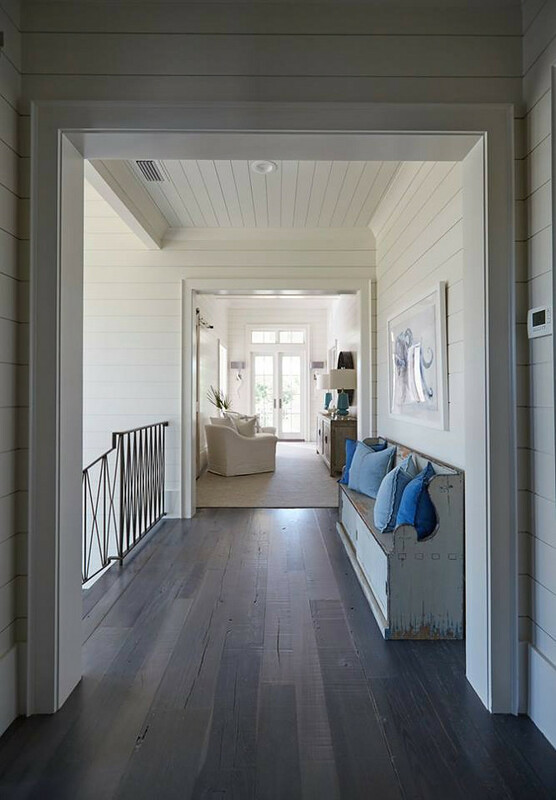 I love the contrast the dark hardwood flooring creates against the white shiplap walls. Lighting is E.F. Chapman Darlana 6 Light 29 inch, Extra Large Lantern. 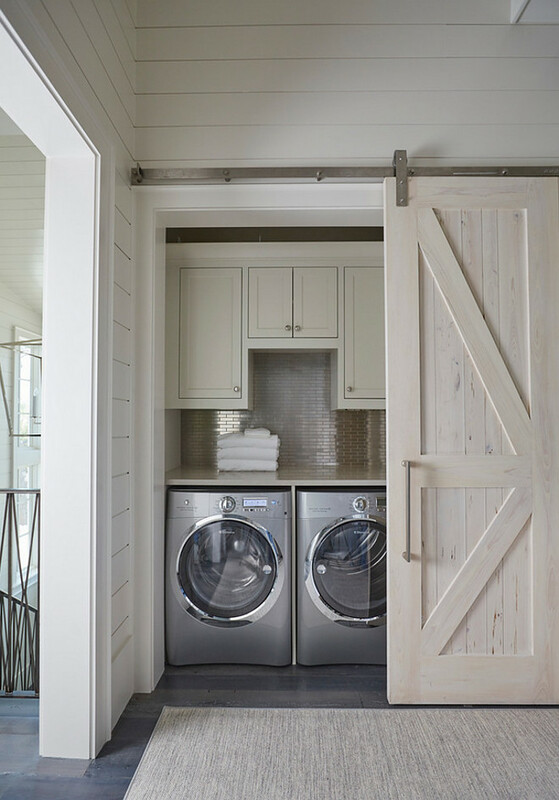 A pecky cypress barn door opens to a hallway closet laundry room filled with light gray shaker cabinets suspended over a stainless steel mini brick tile backsplash. Washer and dryer are Electrolux. 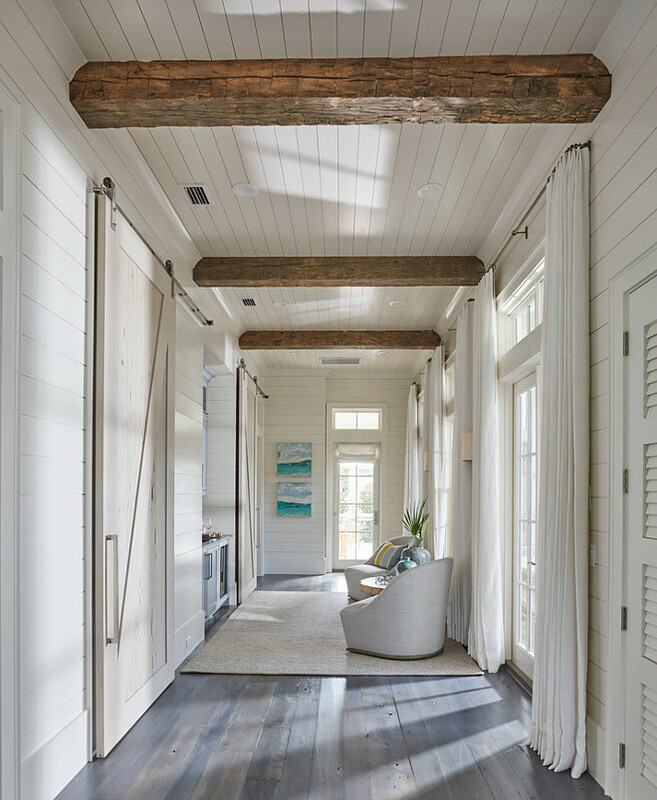 This hallway boasts rustic wood beam ceiling, shiplap walls, shiplap ceiling as well a wall of French doors and transom windows dressed in white cotton curtains. 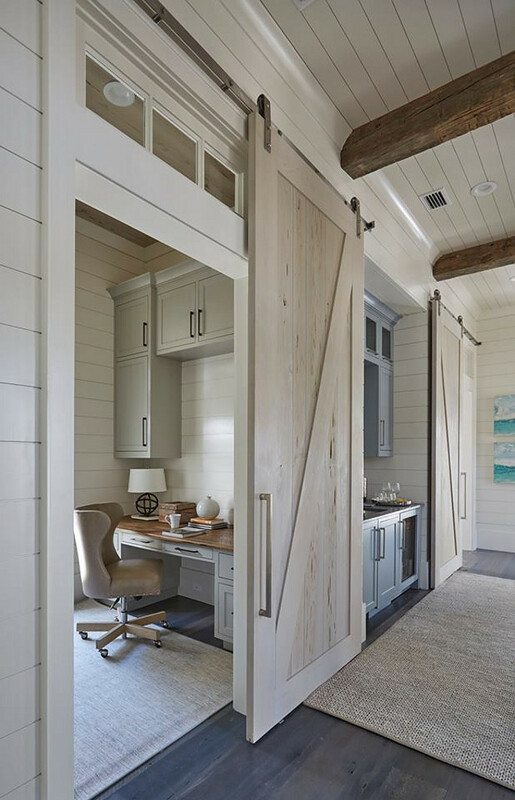 One of the Pecky Cypress barn door opens to reveal a home office with light gray cabinets suspended over a gray built-in desk with wood top. 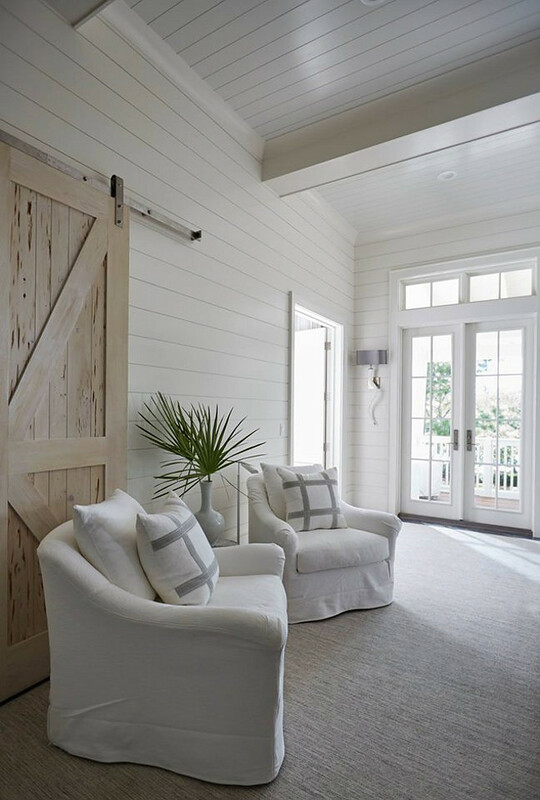 Barn doors are painted in a custom whitewash stain. Desk Chair: Verellen – similar here – Others: here, here, here & here. Similar Rugs: Office & Hallway. A blue wet bar is tucked into a nook. 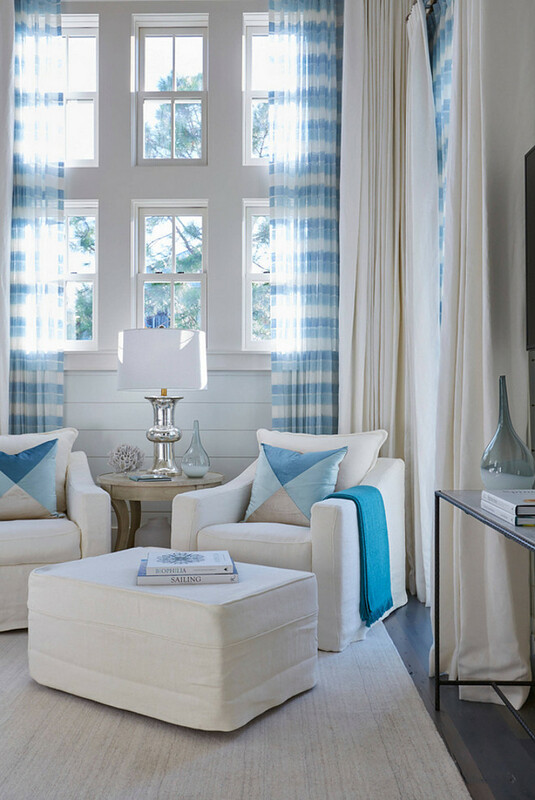 The blue wet bar paint color is similar to Benjamin Moore HC-145 Van Courtland Blue. This white shiplap barn door opens to reveal a kids’ bedroom filled with white built-in beds with storage drawers. 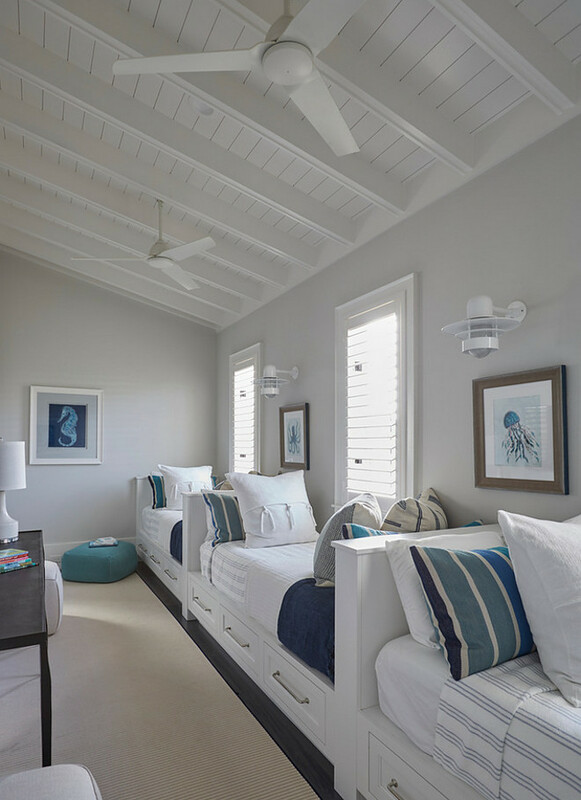 The kids’ bedroom feature a row of white built-in beds fitted with storage drawers dressed in white and blue striped bedding. Similar color is Benjamin Moore Classic Gray. The kids bathroom features recycled glass countertop. What an amazing master bedroom! 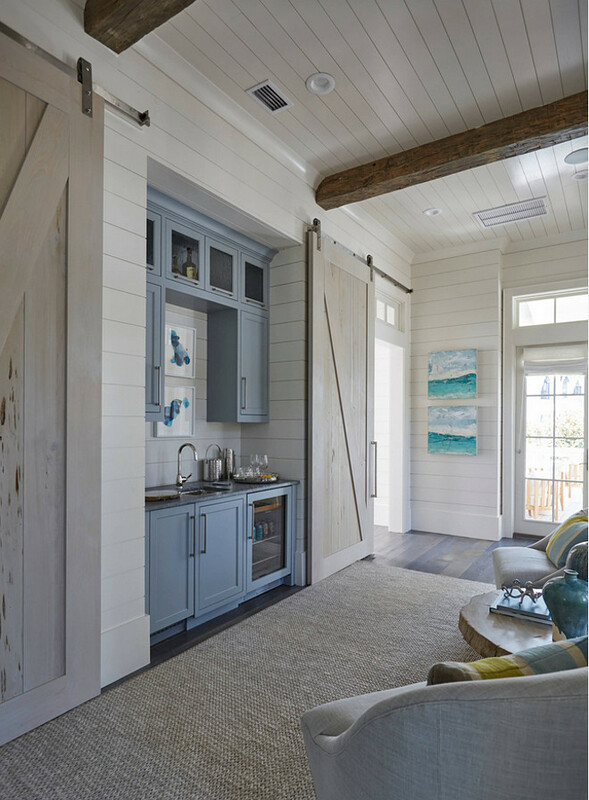 This space is perfect designed, Notice the shiplap walls and the vaulted shiplap ceiling. 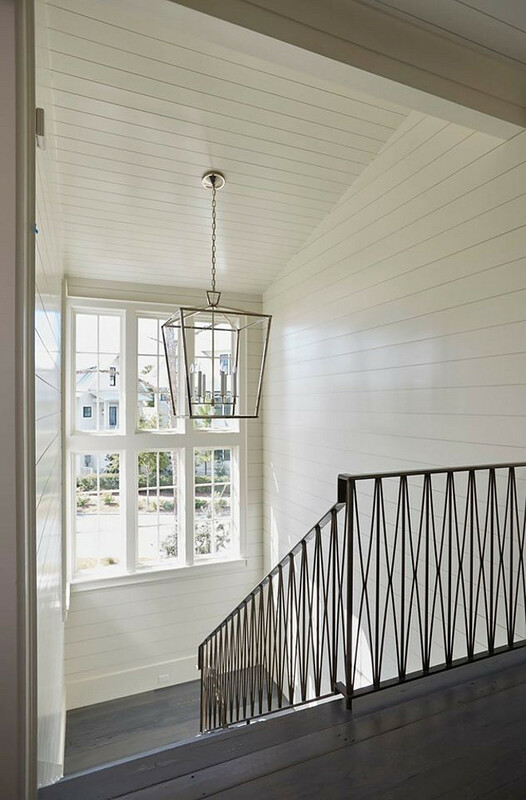 The shiplap walls are painted in a soft grey color. Beautiful Nightstands: here, here & here. 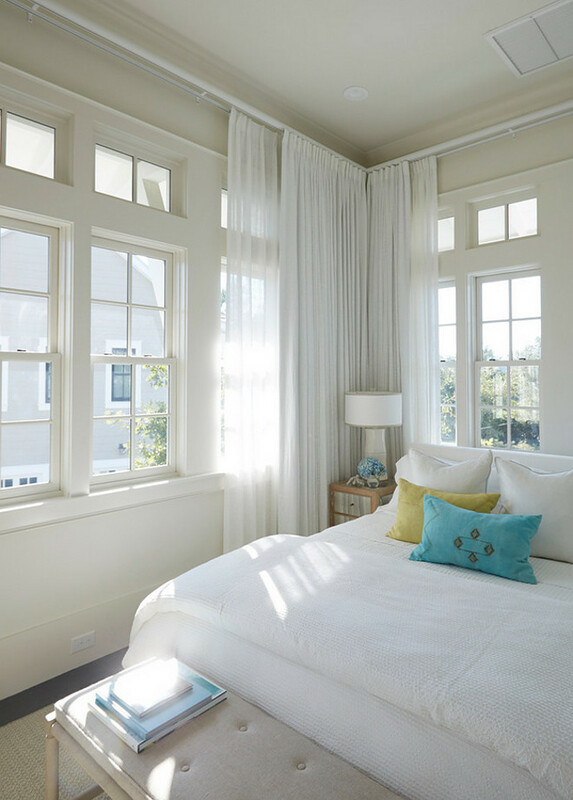 The bedroom features a soft, calming color palette. 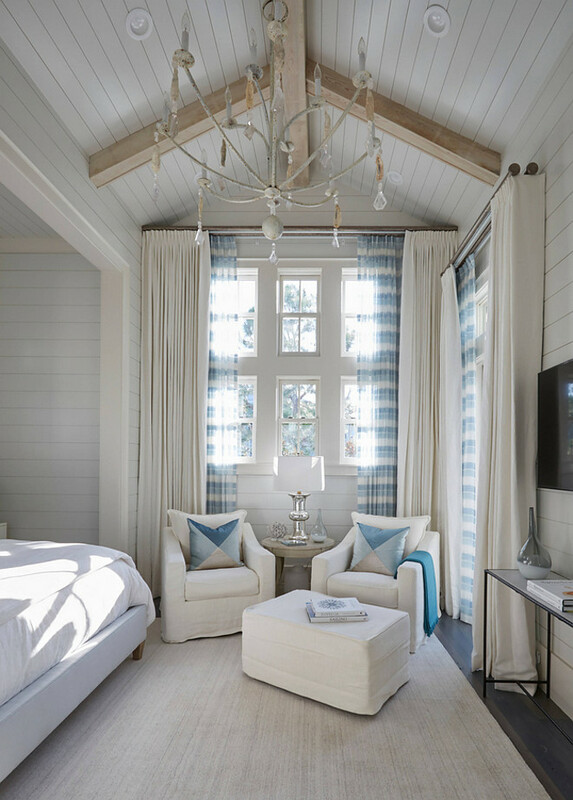 Gorgeous bedroom sitting area with slipcovered chairs and blue and turquoise accents. 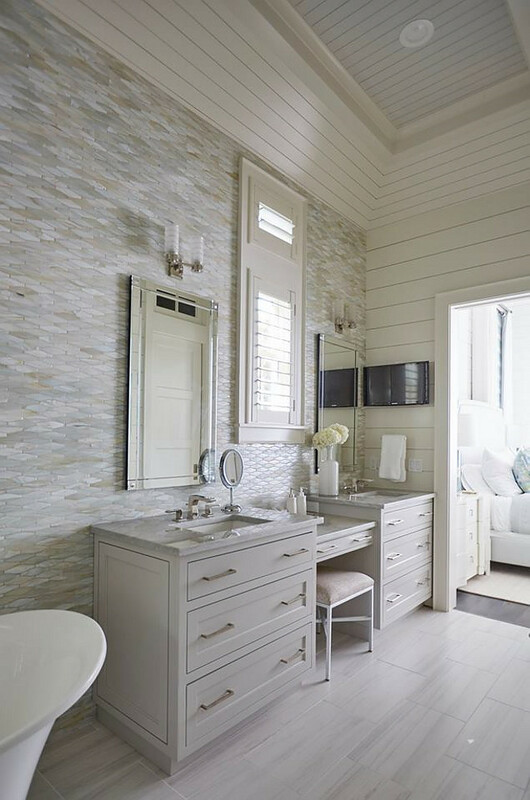 This master bathroom features an oblong marble tile accent wall, neutral floor tiles and light gray his and her washstands flanked by a drop down makeup vanity. Vanity paint color is similar to Benjamin Moore OC-52 Gray Owl. Similar Wall Tile: here & here. Similar Floor Tile: here & here. 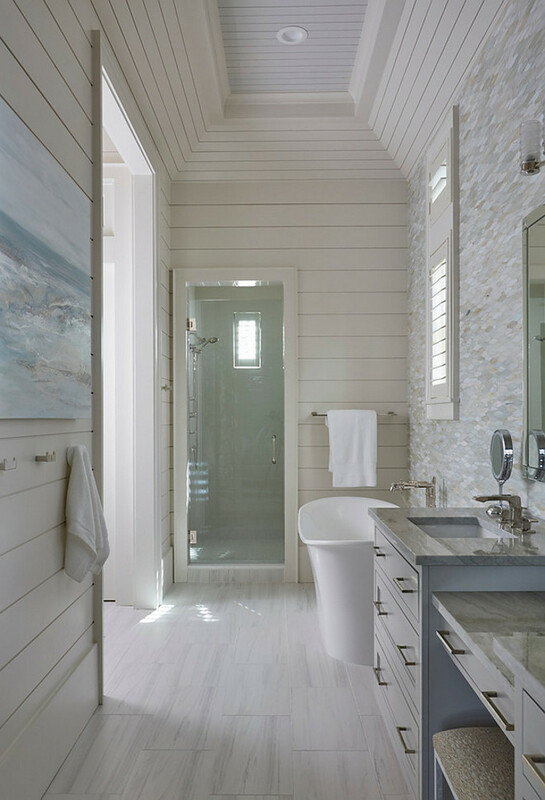 The master bathroom also features a rectangular tray ceiling accented with shiplap trim. 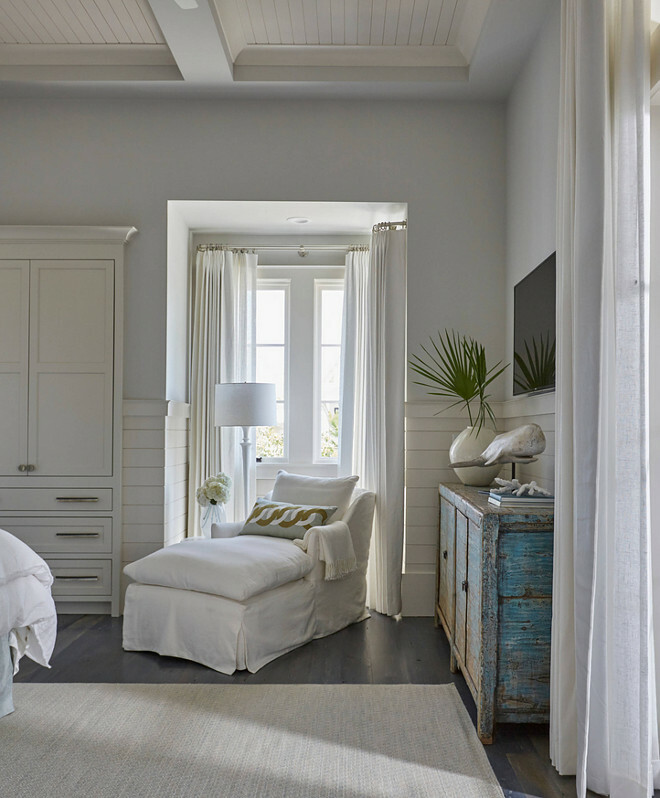 Best off-white paint color by Benjamin Moore: “Benjamin Moore OC-17 White Dove”. 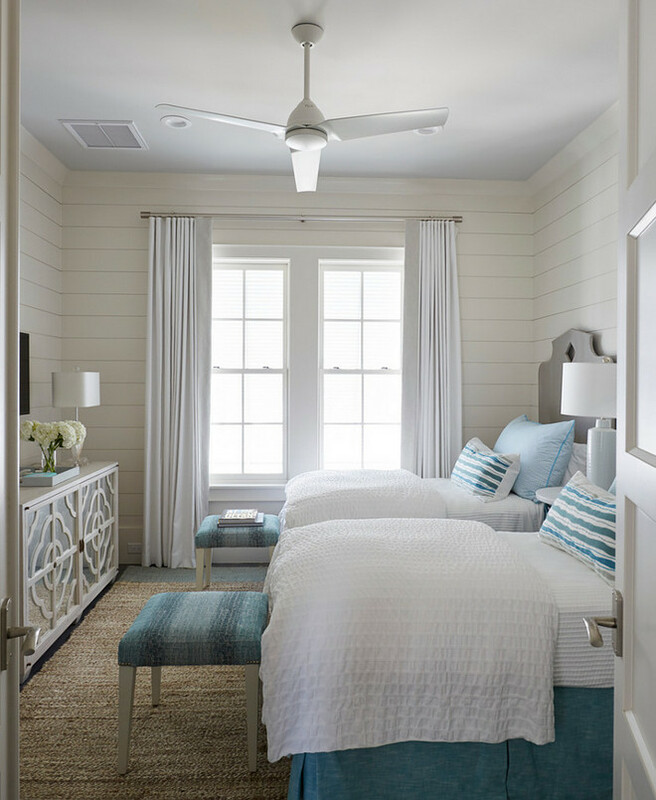 The bedroom hallway is filled with a shiplap wall lined with white slipcovered chairs. 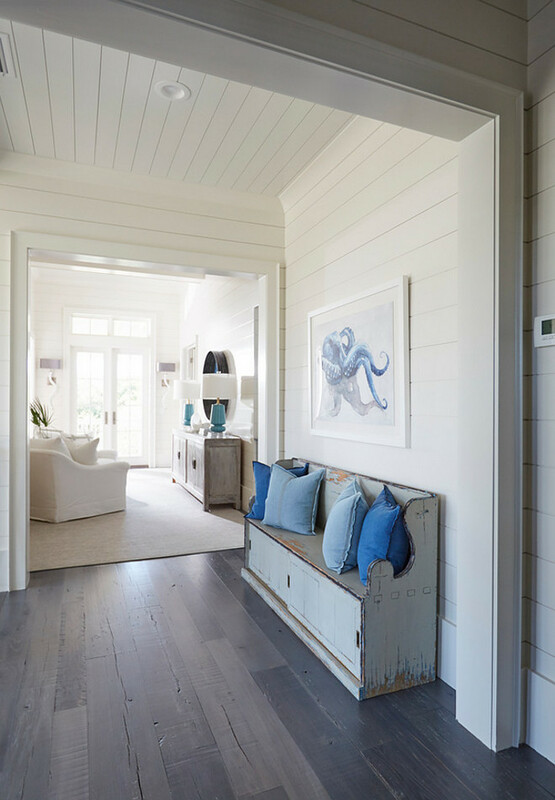 Shiplap walls are 8″ nickel gap paneling. 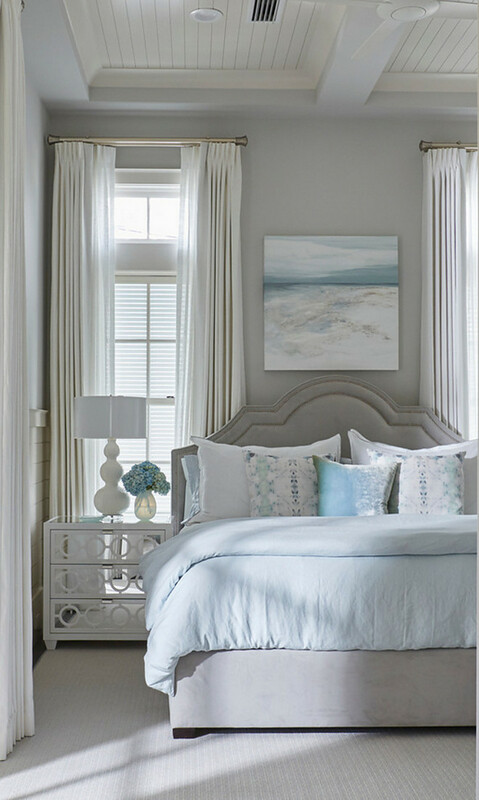 This blue and gray guest bedroom features a gray velvet bed dressed in white and pale blue bedding placed next to a white mirrored 3-drawer nightstand. Nightstand is Worlds Away Ava White Lacquer Nightstand. Similar paint color is Benjamin Moore HC-170 Stonington Gray. Inviting reading corner nook with white chaise lounge. 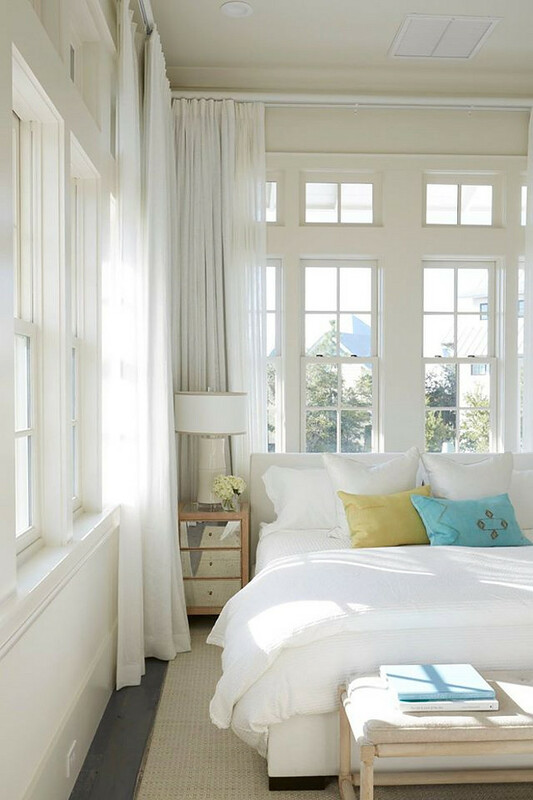 Windows are dressed in white cotton curtains. 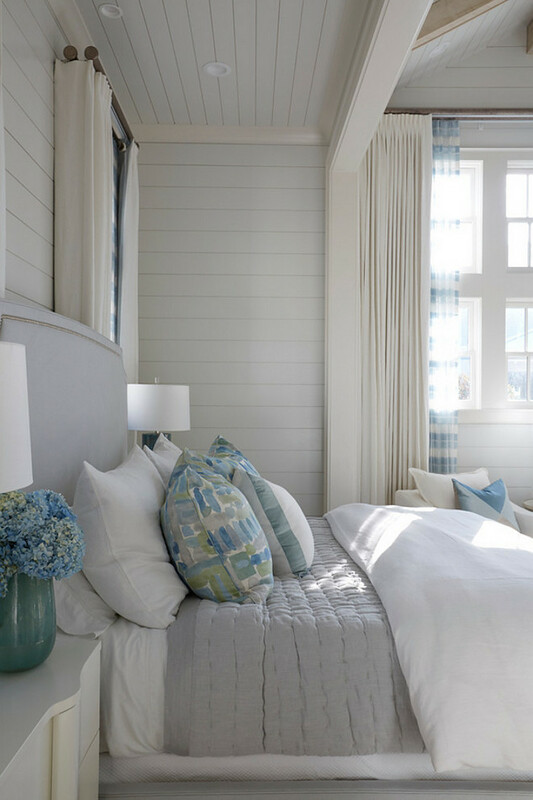 This gray and blue beach style shared bedroom features two carved gray headboards on twin beds dressed in white and blue bedding. A pair of blue benches sit at the foot of two beds facing a gray quatrefoil mirrored cabinet tucked under a flat panel tv. Similar white exterior paint color: “Natural Choice SW 7011 by Sherwin Williams”. This property also features a guest house. A screened-in porch connects the main house to the guest quarters. 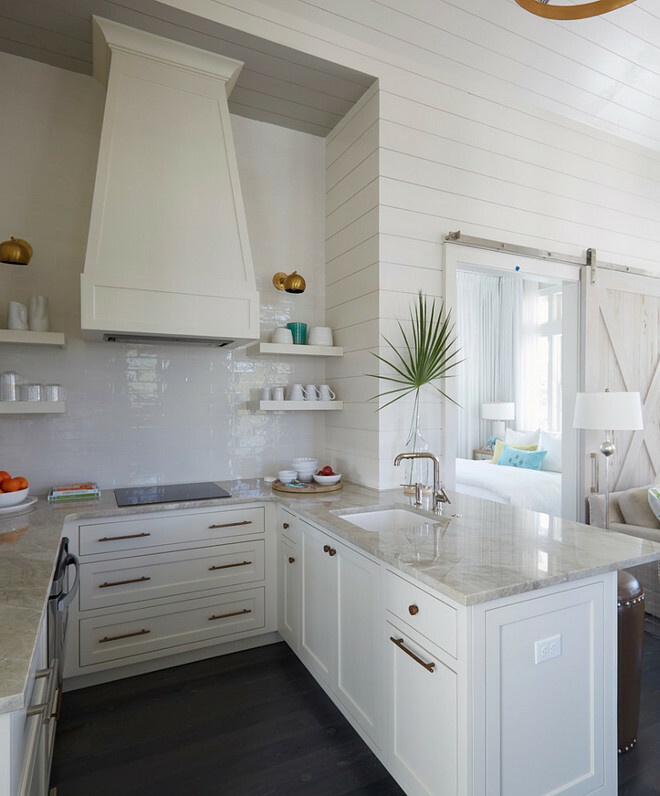 Located in the guest house, this small U-shaped kitchen features a white French hood, stacked white floating shelves, suspended over an induction cooktop with pot and brass wall sconces. A kitchen peninsula is topped with Perla Venata quartzite fitted with a sink and modern faucet which overlooks the family room. 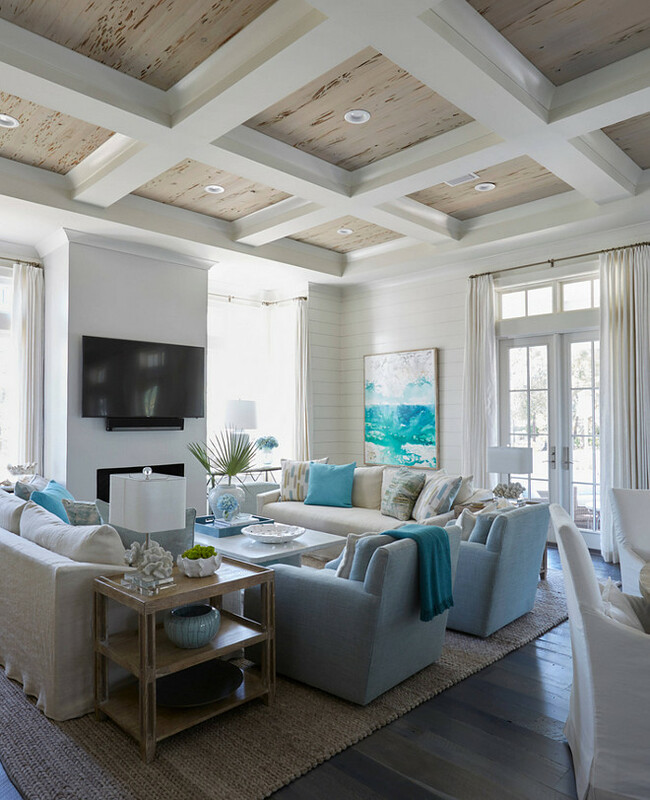 The small living room features a taupe sectional lined with turquoise blue pillows facing a low wood tv cabinet. A gold striped drum pendant hangs from a tray shiplap ceiling while a pair of wicker pod chair provides additional seating. 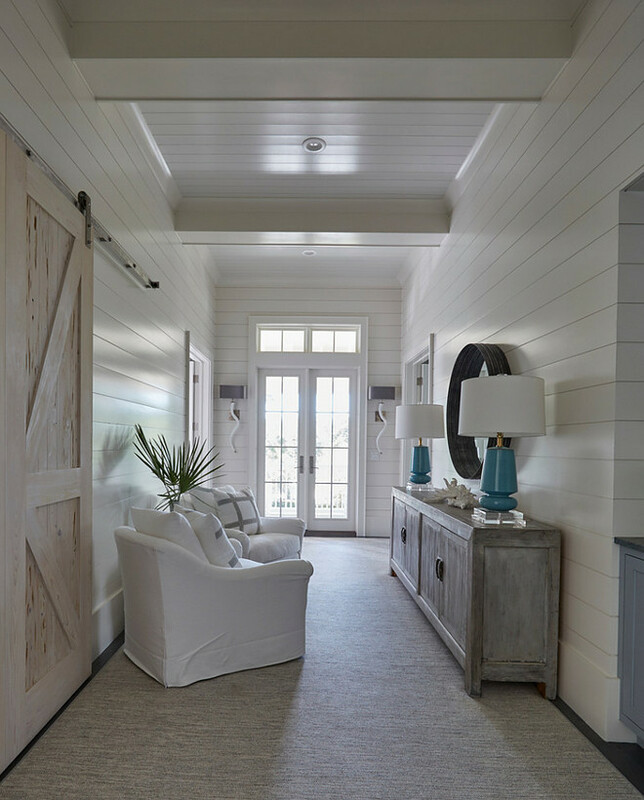 Barn doors are Pecky Cypress painted in a whitewash stain. 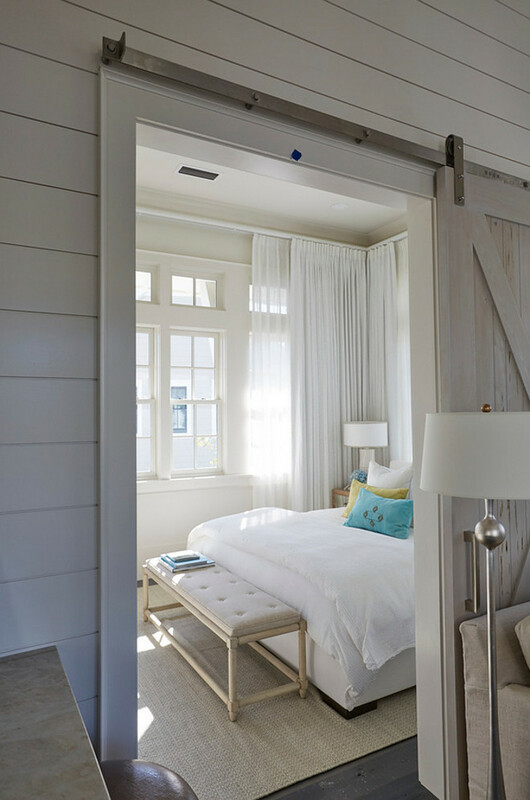 The pecky cypress barn door opens to a beach style bedroom. Natural Choice SW 7011 by Sherwin Williams. 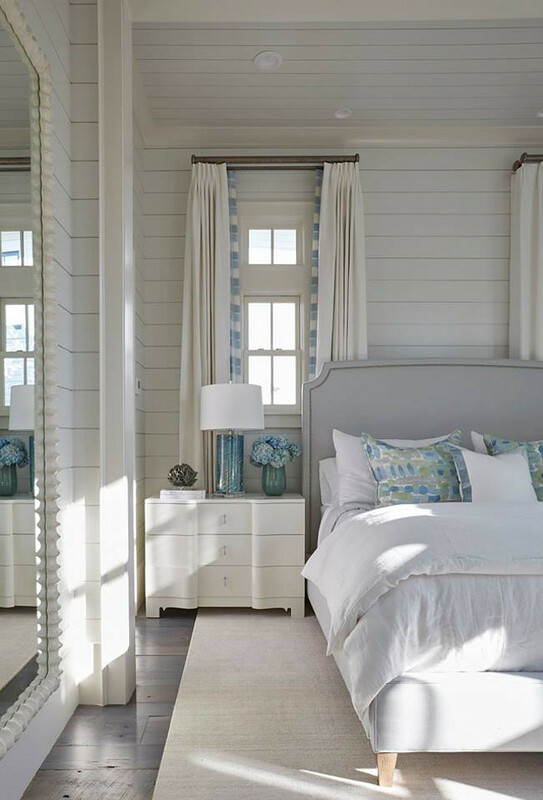 This coastal bedroom is decorated with a white upholstered bed dressed in green and blue velvet pillows and a small mirrored nightstand. Wall of windows are dressed in white curtains. 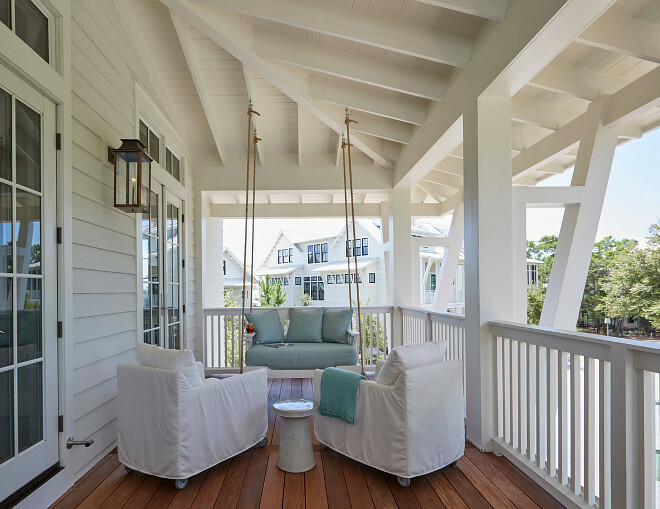 The main house features a dreamy porch with a white and turquoise rope swing and a pair of white slipcovered chairs. Thank you to Geoff Chick & Associates, for sharing all of the details above! Sources: Geoff Chick & Associates. Photos by Colleen Duffley. 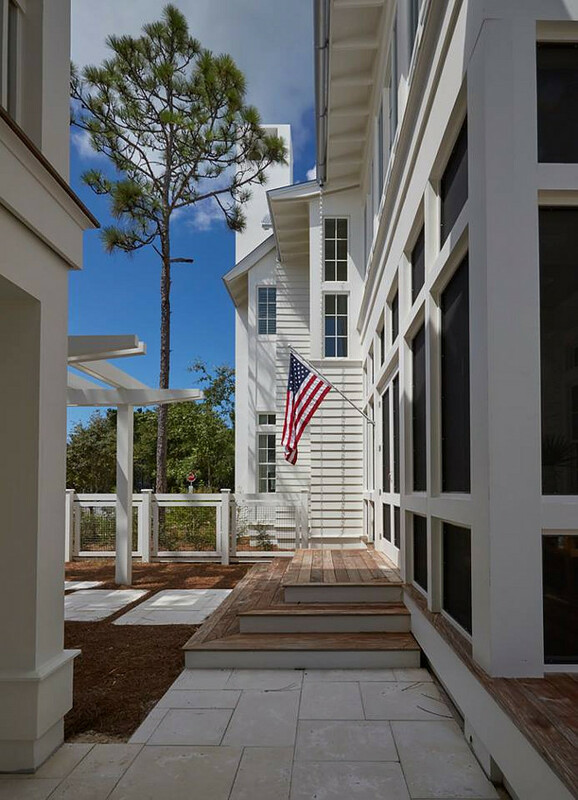 Built by Chris Clark Construction Incorporated. Serena & Lily: Summer Tent Sale – 30 to 70% Off!!! 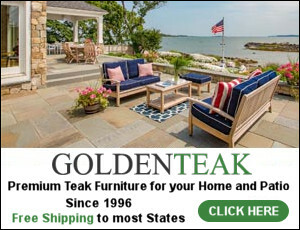 Wayfair: Black Friday in July! 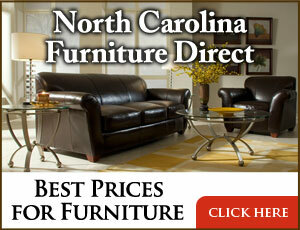 Up to 70% OFF – Huge Sales on Decor, Furniture & Rugs!! 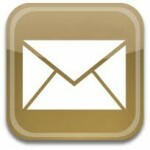 Joss & Main: Flash Deals! Up to 75% Off!!! Palm Beach, Florida Dream Home. 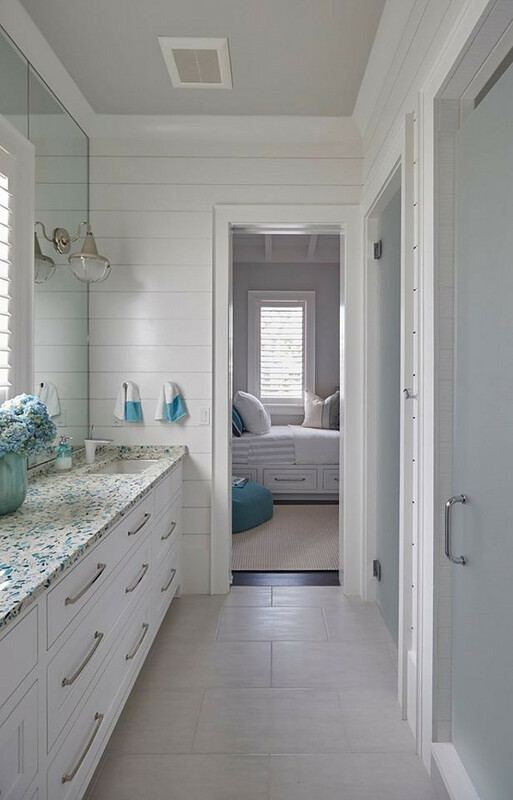 thank you for this post, beautiful coastal details i”m working on a beach condo and was vey inspired by this post. I know that home very well… love her account, actually! 🙂 Thank you for sharing this! One edit…the kitchen cabinetry looks more like BM Stonington Gray to me than White Dove. They are a light gray with blue undertone. Great post and I want this house. I must do more research on this home builder. Any idea where the master oblong marble wall tile was purchased from?? Is the surround around the fireplace Venetian plaster? Or what is it? Can you tell me the brand or where to find those 2 chairs (one with ottoman) in the sitting room area? Also, I love the front door color in the 2016 Farmhouse picture, almost a seafoam, color. Can you tell me this color ? Where did you purchase the pine sideboard table? Any ideas for a paint color similar to the gray used on the desk and built in cabinets? Benjamin Moore Stonington Gray is a very similar color.